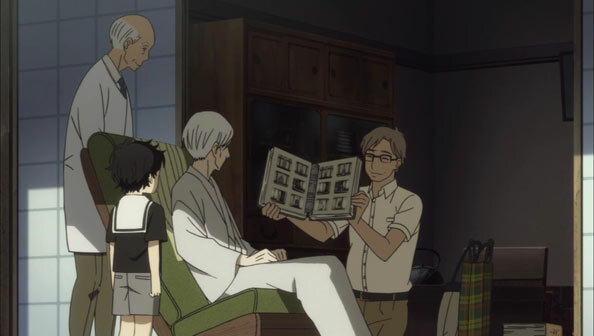 After a taste of Kyoto-style rakugo (which has a lot more props than Tokyo style…not sure I like it) courtesy of Mangetsu, who is trying to make a comeback after ten years out of the game, We see a frail and withered Yakumo showing his grandson one of Sukeroku’s albums. 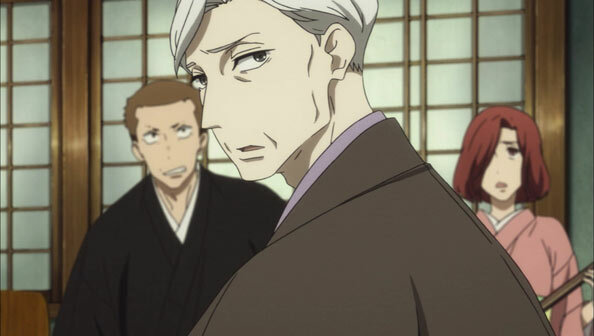 Higuchi and Matsuda then come in to show Yakumo the veritable bonanza of recordings and memorabilia the professor has collected over the years. Higuchi leaves it up to Yakumo whether the recordings and such were ever to be released to the public, or destroyed. Yakky says he’ll think about it. 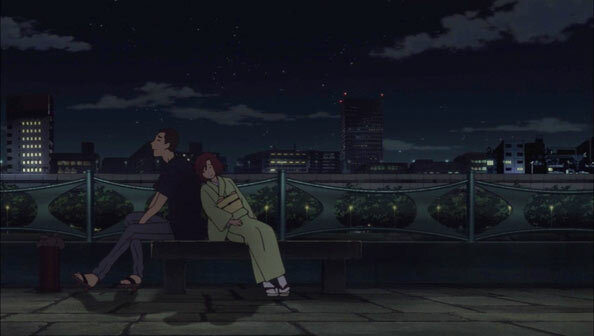 In a really, really lovely scene, we see the happy couple of Yotaro and Konatsu relaxing on a warm night, and Konatsu rests her head on Yotaro’s broad back and asks him to perform some rakugo, and is no doubt soothed by the vibration of Yotaro’s voice as he does so. 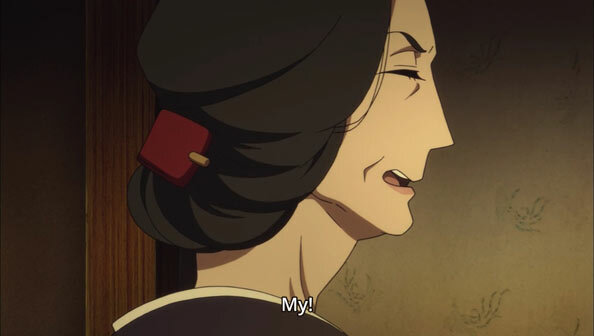 It’s personal rakugo; not for a crowd, but for someone close. Or at least, that’s how she chooses to label her love for the man who brought her in when she lost both her parents and raised her into the fine woman she is. Yakumo concedes that fate may not be ready to let him die. 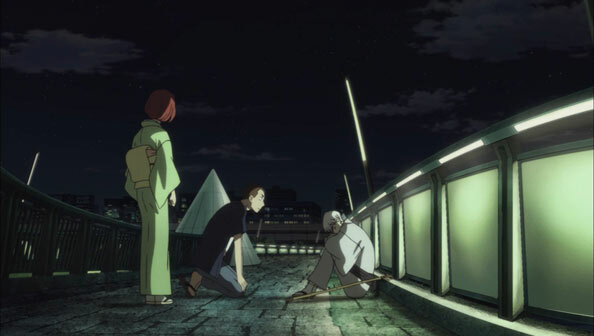 Yakumo visits Kido Isao, an old friend and who owes him a “debt that can’t be paid”, knows how to keep quiet, and longs to hear Yakumo perform again. Then, one night, after seeing a play with Matsuda, Yakumo finds himself the victim of his loyal servant and family’s machinations. To wit: he’s being forced into a performance before a small, select audience of old friends, colleagues, and patrons. When he threatens to leave, the lady of the Yanashima Inn “insists” by hilariously shoving him onto the stage. But before Yakumo has to perform, he yields that stage to his “dunce” of a student, who performs “Shibahama” to his master’s shock. When asked how he learned it, Yotaro confesses to having watched the film, though doesn’t go so far as to hear the truth of what happened at that inn so many years ago. As for his “Shibahama”, Sokuroku’s was, in my opinion, far superior. But to Yotaro’s credit, he uses his tendency to weep easily well here. When it’s finally Yakumo’s turn, he introduces himself with an air of “whelp, I guess I can’t rest easy yet, so despite my dry tongue here goes”…only to be rudely interrupted by a police raid that has come to arrest Kido Isao. Have those coppers no decency?! 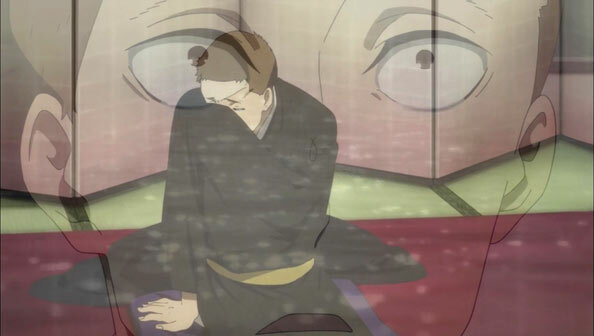 One also wonders if, like when his suicide was thwarted by the sudden appearance of Yotaro and Konatsu, if there’s something to the fact that he was so harshly silenced just when he was about to do rakugo again.